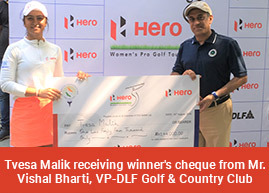 Greater NOIDA, Feb 20: Tvesa Malik, who won last week to rise to the top of the Hero Order of Merit on the Women’s Pro Golf Tour, will start as one of the big favorites for the fifth leg as the Tour arrives to the Northern part of India for the first time this season. The first four legs, all in the Western part of India in Ahmedabad, Mumbai and Pune, have all produced different winners, making the upcoming leg a wide open affair. Even though four players Vani Kapoor, Amandeep Drall, Sharmila Nicollet and Gaurika Bishnoi are busy with the Australia Ladies Classic at Bonville Resort in New South Wales, the rest of the field has a strong feel about it. The first two events of the current season were won by Vani Kapoor and Sharmila Nicollet, who have since been overseas, while Gursimar Badwal in the third leg and Tvesa Malik in the fourth turned in fine performances. Tvesa and Gursimar, who head the Hero Order of Merit as first and second respectively, have been the most consistent so far. Both have won once each and also finished second on one occasion. In addition Tvesa was Tied-3rd in first leg and sole third in the third. Gursimar was third alongside Tvesa in the opening leg. Tvesa’s poorest finish this year has been Tied-3rd, while Gursimar’s has been fifth in the last leg. So, both are in good form and their battle should be engrossing. Meanwhile Neha Tripathi, who turned 26 a day before the fifth leg, will be seeking a win as a birthday present to set her up for the rest of the season. Another player seeking to open her account will be Saaniya Sharma. Both Neha and Saaniya have come close to winning in some of the previous events and will attempt to go better this week. Another player to catch the eye has been the Chennai-born Bengaluru-based Suchitra Ramesh. The 18-year-old, who turned professional last year, came close in the fourth leg at Pune, where she finished runner-up to Tvesa. It was Suchitra’s best result of the season. She was earlier 10th in the first leg and T-8 in the second. Trisha Sunil and Tavleen Batra will go out first in the two-ball, while Khushi Khanijau, Tvesa Malik and Ayesha Kapur will be in the second group. Gursimar Badwal plays with amateur Tanirika Singh and Neha Tripathi in third group, while Smriti Mehra, Suchitra Ramesh and Mehar Atwal are together in the fourth. Afshan Fatima, Sonam Chugh and Siddhi Kapoor will go out in the fifth group while Anisha Padukone, Saaniya Sharma and Millie Saroha are in the final group.